My husband just made a spiced hot chocolate while I quickly diced veggies for a pizza. We’re doing it the easy way—purchased whole wheat crust and grated cheese. That way, I got to spend most of the afternoon in the studio and now I’m sitting with my hot cocoa. I finally got to cut and arrange the birches on my stitched background and I added some black spots and lighter grey areas with fabric paints. Once it’s dried overnight and ironed, I can add some stitching. After that I pulled out one of my Gelli prints to do a bit of free motion stitching on. It’s to be used as a donation in an upcoming SAQA auction if all goes well. I often like to outline in black and add layers with other threads overtop. Something else I’m working on a few strips at a time is this piece of muslin oversewn with selvedge edges. This has been laying over the back of my computer chair for ages! Another project I’m going to finish. I’ve added about 10” more and have about that much to finish it. The plan is to add batting, lightly stipple quilt it and then make a simple slip cover to slide over the back of the chair. Im feeling satisfied finishing up some old projects as well as starting some new ones. Always percolating are ideas for what’s next. Happy Saturday, I hope you’re having a good one. I’m so excited to let you know that my last 2 fiber art pieces, Waterfall and Autumn Umbels and Ferns were accepted into the SAQA Atlantic Canada show, Transitions which will open in April in Dartmouth, NS. They will travel to the Inverness Art Centre October 2018 and to the Art Centre Saint John. in 2019 with more venues to be announced. For some time I’ve wanted to make a quilt of softer colors for the my bedroom. The majestic mountains pattern is one I’ve liked for a while too. I’m using the tutorial by Bonnie Hunter. I couldn’t wait to try a few sample squares to get the idea. The blocks aren’t sewn together yet. I cut about half of the squares that I'll need. I'm going for a more neutral look, a sort of 'low volume' look so I may remove the few darker ones. Yesterday, during the snow storm I also finished the tote bag except for slip stitching it closed and top stitching along the top edge. I am planning a small reno here in my studio. I have my 2 machines set up along the outside wall. since it's such a small room -- about 9+ ft by 10ft-- I can't do much else in the room except sit at my computer just opposite. Beside the computer space is a closet full of fabrics and a few other quilting supplies. the pain is to remove the wall, install cabinets across the top, and extend the counter all the way across making room for my 2nd sewing machine on the right. I would have room fro a couple of IKEA cabinets below. This would allow me to remove the desk in the opposite corner making room for an armchair for hand work. The second phase would involve installing a second window which would make it more like a sunroom and give me a better view. The sun is shining this afternoon; however, besides shovelling the front steps and walk, I opted to stay in as its pretty slippery after the storm yesterday. I've been stitching on this fall/winter scene. It's almost ready to have the large birch trees added. This morning I went to quilting at our civic center. While checking my mailbox on the way home, I noticed a fallen branch and couldn’t resist breaking off a few twigs. I love the lines and shapes. It’s a very mild day. We had a few inches of fresh snow this morning making everything fresh and white. I’m taking another day off from snow shoeing due to a problem I’m having with my back and neck. It’s causing a cervicle vertigo which leads me to need to lie down to avoid the nausea. The view from my window is pretty though. Winter skies are so soft and pretty. Wearing my heat belt, I started a batch of applesauce raisin bread in the bread maker. I purchased the machine just before Christmas on sale. It is getting more difficult for me to stand and knead bread. 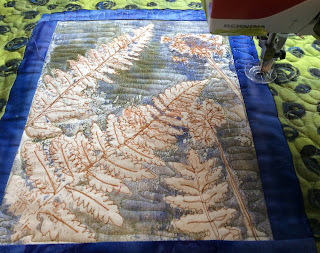 Then I spent about an hour in my studio free motion stitching a bit more on my latest piece. What shall I name it? Sill more to come in the foreground. Now that the background is done, I can add a few trees up front. Next session. In the meantime, I’m taking a break with a cup of tea here in my spot by the window. Maybe I’ll knit a bit on my latest socks. Before supper ( leftovers, yum!) I’ll run outside with the garbage, compost and recycling. Hubby has driven to Montreal with our youngest son to see a hockey game tonight. Montreal versus Boston. It is a 60th birthday gift. So I’m having a quiet weekend at my own pace. I’ll probably be in my pjs right after supper, lol. I’ve made plans for a short, gentle snow shoe with a friend tomorrow. We’ll see how it goes. I hope you’re having a nice weekend, making time to enjoy some fresh air and maybe a little creativity. When we got up this morning it was raining which soon turned to freezing rain and then fine snow about mid morning. We’ve stayed inside being creative. Hubby was working on a stool for our grandson to be able to stand at the kitchen counter and be mama’s helper. The bottom is made from an IKEA stool. He followed directions on Pinterest for the rails on top. This is my grand niece using the one her dad made. While he was busy in his workshop, I was in my sewing studio putting the borders on a baby quilt. I had to stop before I got the fourth one on but it’s pinned and ready to go. I was watching my eggplant slices baking in the oven. There happened to be one in my fridge that needed to be used and yesterday I noticed a recipe called bacon eggplant on Facebook yesterday that looked good. The sandwhich called for tomato’s and lettuce. In place of tomato I melted a slice of Havarti on one slice of the bread and added lettuce. Although the roasted eggplant didn’t really remind me of bacon the sandwiches were yummy. After lunch, I went back to the studio to have a little more creative fun, free motion stitching the background on a little art piece. There’s more to be done before I move to the foreground. As I looked through some of my photos I decided it needed a few small fir trees here and there. The simplest way for me to do them is to hoop up some water solvable stabilizer and use the free motion zigzag. I will add a few bits here and there directly to the background also. I’ll add a few mediums and lights before removing and stitching to the piece. When that’s all done, I’ll move to the large birch trees I want to add in the foreground. Once I felt the creativity flowing, I really wanted to keep going; however, my back and shoulders were protesting. It was time to take a break. At least I’ll be anxious to get back to it. This is where I am for now. It’s kind of grey today and since I was out snow shoeing yesterday, I decided to stay home. I like to be a bit active in the mornings. It helps me to wake up and to work out the stiffness. A couple years ago before my hip replacement, I tried to paint parts of my kitchen table and chairs. It was looking a litttle worn and tired. With all the bending involved I wasn’t able to do it. As part of my resolve to finish a few projects in the house this year, I started it this week. From my laundry room paint job, there was a part gallon of primer and semi gloss grey paint leftover. Might as well use it. The wood on the chair back will be grey too. It just needs priming. I’m leaving the seat and the table top which will get sanded and finished when I can take it outside. I need a primer coat and two coats of paint all of which will be done a little at a time. After lunch, I headed into the studio to finish the quilting on the Gelli print tote bag. Then I trimmed it, stitched the sides together and cut the lining. I didn’t put it together yet as I have to make the straps. In the meantime I had pulled this piece from the closet — another unfinished project. It is layered with strips of fabrics in colors that reminded me of the skies when I’m out snow shoeing. Once it’s all stitched down and the foreground bushes and small trees are stitched, I want to add 3 birch trees. It is only January but I’m determined to finish up a few things before I start something new. My closet is full! I’m in the process of planning and getting an estimate to open up the double sized closet and add kitchen cabinets to the top. I currently have a desktop in there so I would also like a countertop across the width which would make room for a sewing machine. The idea is to clear up some space in the room to be put to better use— mainly an armchair for hand work. It is a nice sunny room and I’d like to take more advantage of it. I will post picks when I get started. First, I have projects to finish and cleaning out to do! Here I am in my sunny cozy studio on this winter day finishing up a wee bit of hand stitching, blanket stitching the piece of wool felt to one end of the sewing kit. There is a tiny bit of stuffing added to it. The next one I make would be a bit bigger but this one will fit nicely in my knitting bag or a hand sewing basket. 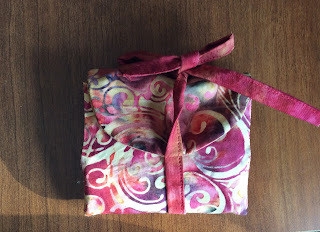 Then, I did the free motion quilting on the tote bag that I'm making using one of my Gelli mono prints. I'm almost finished but have to stop for a break. My shoulder can handle only a short session. Besides, the fresh air is calling me as I sew. This is my view. 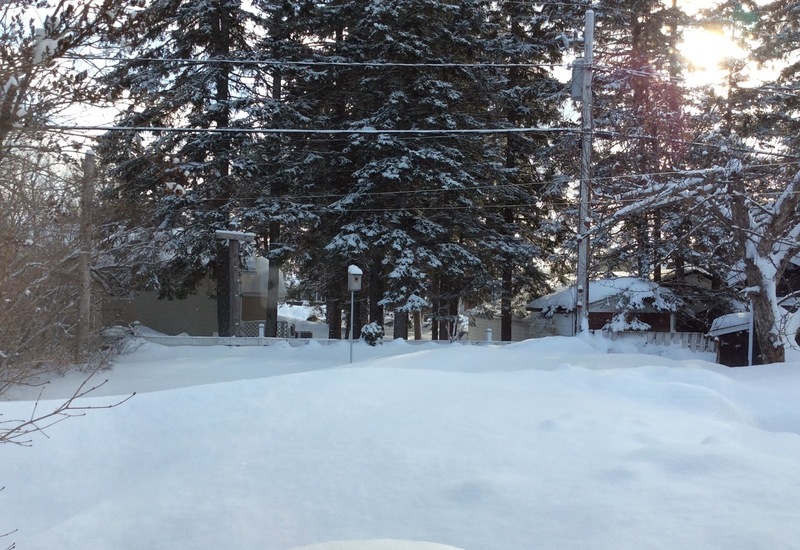 There is a lot of snow! I don't have the car to get to the trail today, so I decided I'd head out to do a bit of snow trimming off the front walk. When I walk to the front door any parcels I carry hit the sides. I'm heading out now and hope this works. I just got a new computer and I'm trying it out. I’d planned to spend the afternoon in my sunny sewing studio. The problem is the sun and blue skies and perfect snow call to me and I had to go snow shoeing with my buddy. It’s pretty cold right now but once bundled up and in the woods it’s, beautiful. There’s art to be found everywhere. A storm is forecasted for Thursday into Friday so I’ll have studio time to work on these little fun pieces. I’m free motion stitching parts of my Gelli prints to use for the pockets in a small roll up sewing kit. 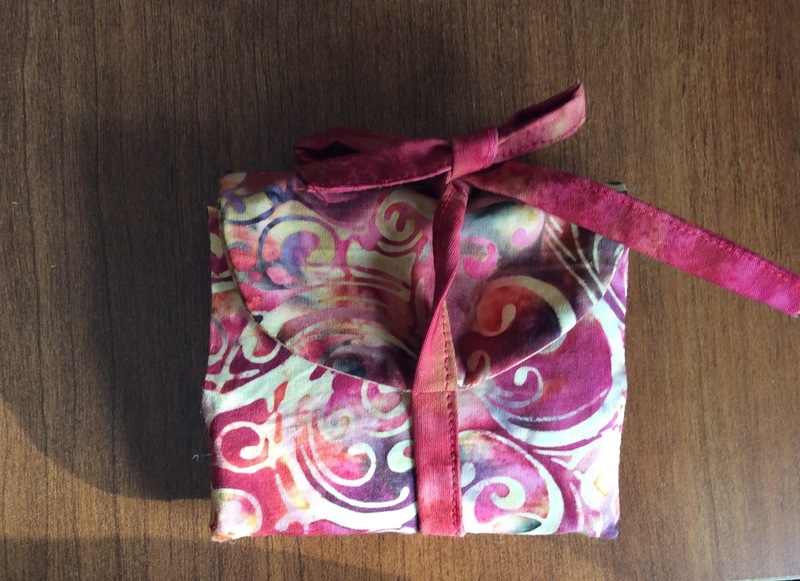 I also finished a mini sewing kit perfect for the purse. It’s about 2 1/2” by 3 1/4”. Still room for a pocket and a piece of wool for needles. All the while, I’m thinking about my next piece of fibre art. There a few landscapes that interest me. Also, I’ve had these rabbit pictures taken at the family cottage that I’ve been thinking of too. Not my usual subject, I decided to start with a sketch and watercolour to see how it goes. It needs more color and shading. I had to pick up my friend. My resolve for the new year is to learn how to make videos in my studio. I’ve done a couple of short ones which I’ve uploaded to YouTube. Since I’d need many followers before I can have a link, I can’t share. If you wanted to look, try Holly’s studio sewing kits. I found it that way. I’m waiting for a new computer which I’m hoping to use to directly upload my movies here, something I can’t do right now with this APP. I’m wishing you all a Happy New Year. Tell me about anything new you’re hoping to try this year if you’d like.